There’s a saying in Egypt that if you drink from the Nile, you’ll return. Having unwillingly swallowed a fair amount of water while swimming in the river on my first visit in 2008, I found myself fulfilling the prophecy nine years later. 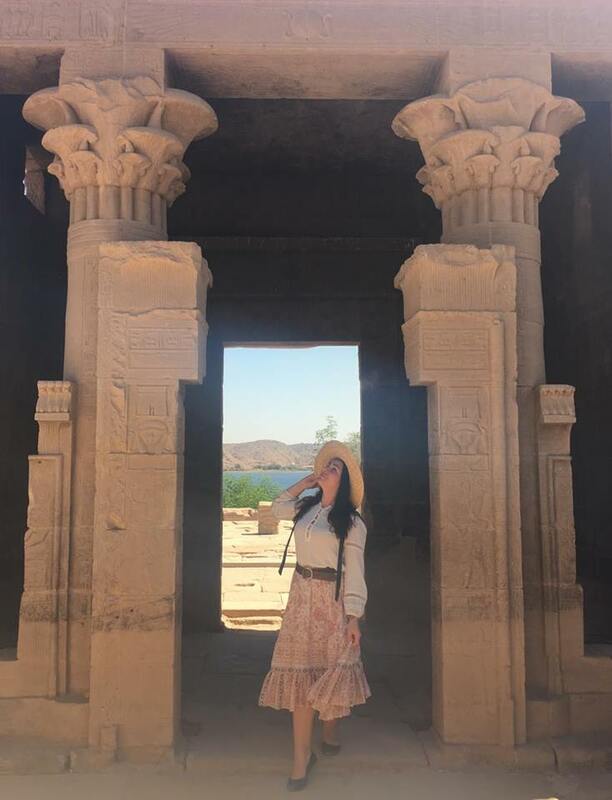 Over eight nights I traveled down from Cairo to Aswan to Luxor with six strangers who quickly became friends on an Intrepid tour. 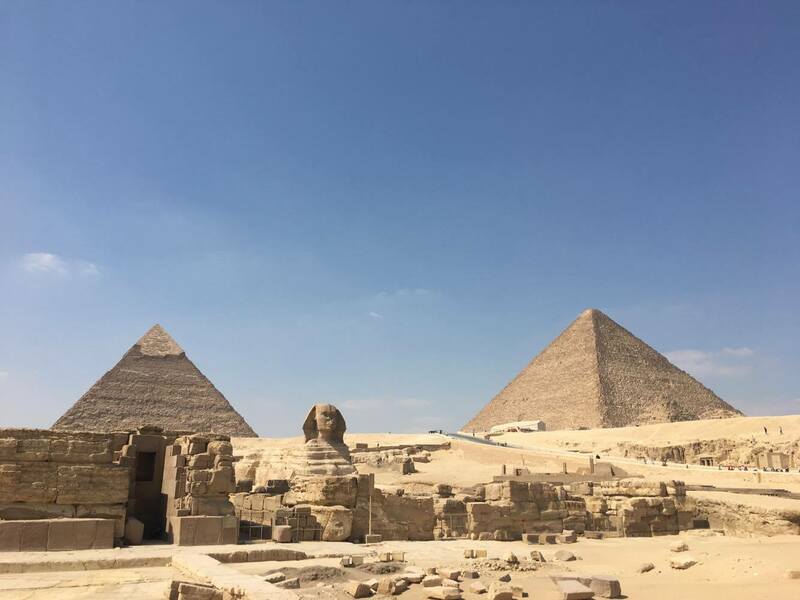 Have you really been to Egypt if you don’t visit the Giza Pyramids? The Great Pyramid is one of the seven wonders of the world – the oldest and the only one still standing. 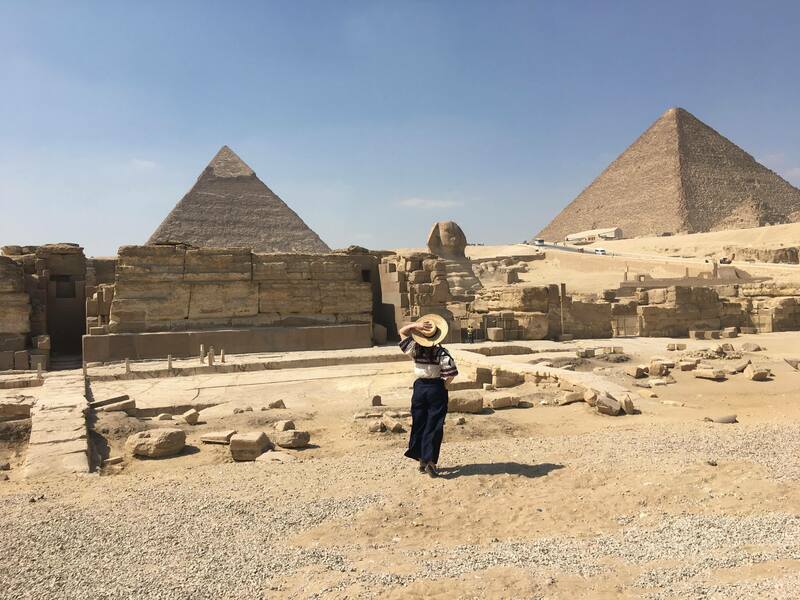 The three pyramids located at Giza are still revealing their secrets. Tickets are required to enter the pyramid complex and I’d recommend purchasing an extra ticket to enter one of the pyramids. The passages are steep, dim, and dusty and the resulting tombs are empty, having been robbed centuries before. But the experience makes you feel a bit like Indiana Jones in Disneyland as you enter the small hot entryway in the rock and explore the galleries, while surrounded by others doing the same. 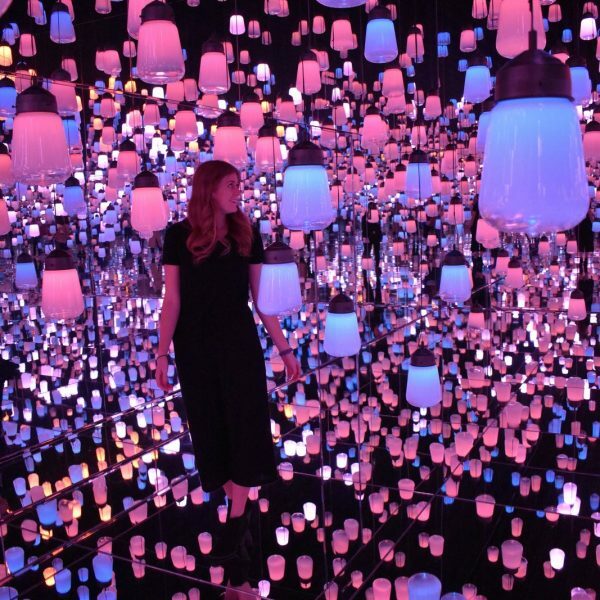 Keep in mind, entry is not recommended if you have asthma or claustrophobia. 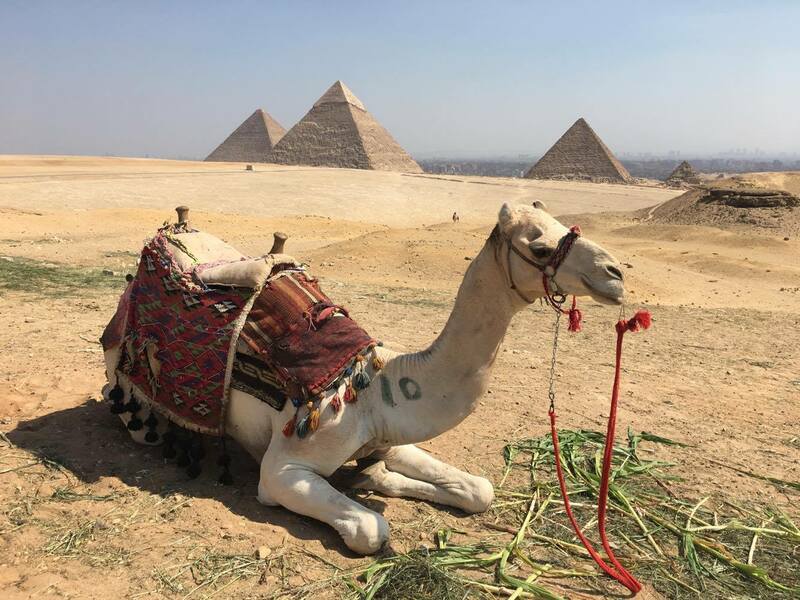 After a trip inside the pyramid, head up the road to the crest above the second pyramid and pick out a brightly tasselled and adorned camel to ride across shifting golden sand dunes where you can stop for a quick photo. Finally pay your respects to the Great Spinx, the broken-nosed half lion, half pharaoh crouching sentinel in front of the pyramids. Before wandering the temple, walk up in front of the seats set up for a night-light show. 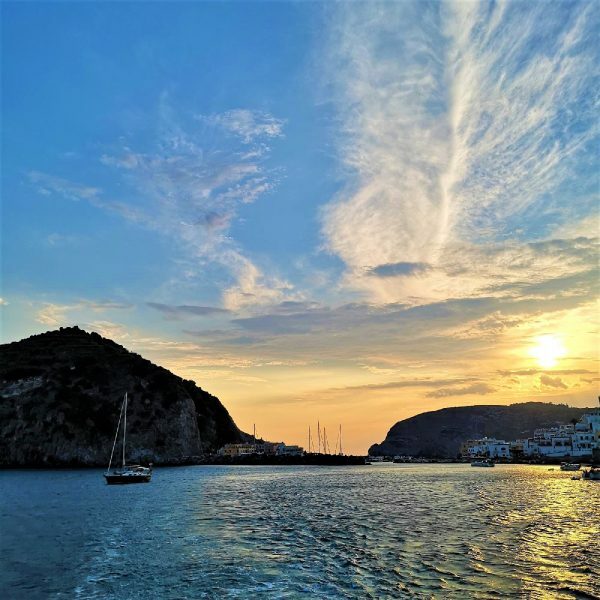 Here you’ll find the perfect spot away from the crowds to drink in the view and memorialize your visit. After a morning at the pyramids, see what has been removed at the Egyptian museum. King Tutankhamun’s blue and gold mask is only one of the wonders retrieved from his tomb in the Valley of the Kings in 1922. The museum is crowded with artefacts from pharoah’s funeral statues to the tools used by the populace, and don’t miss the mummified remains of a crocodile in the mummified animals room. The day isn’t complete without a visit to the Khan El Khalili markets. Easily reached with a taxi, enter on foot through the historical Bab Al Futuh gates, completed in 1067. Walk down a road lined with centuries old mosques and crowded with tourists and locals enjoying the cooler air. The markets themselves are busy and colourful. You’ll have your first chance to perfect your haggling skills amongst stalls of scarves, alabaster sculptures, and antiques. Seek out El Fishawi café for a freshly made falafel sandwich and ice-cold, freshly pulped mango juice or Turkish tea. An overnight train took us to Aswan. Dinner was essentially what you’d be served on a plane, so if you’re a fussy eater (like me) seek out one of the small supermarkets in Cairo and stock up on bottled water, crackers, fresh fruit and cheese. We stayed at the Hotel Isis Corniche which borders the Nile and is across the road from the market. 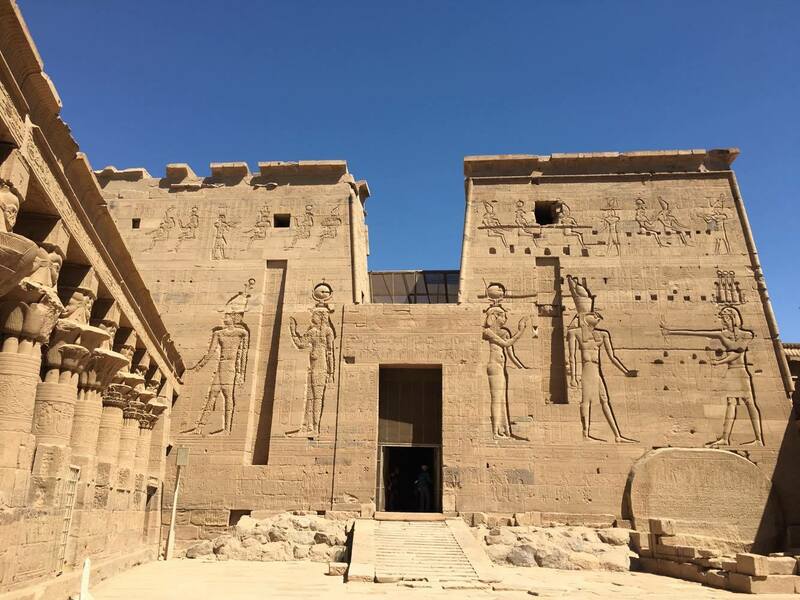 The Philae temple is one of the unmissable highlights of Aswan. You approach Agilkia Island by boat and the ruins come into sight, sandstone columns and large carved walls. We spent at least an hour exploring the ruins before meeting at the café for a coffee. 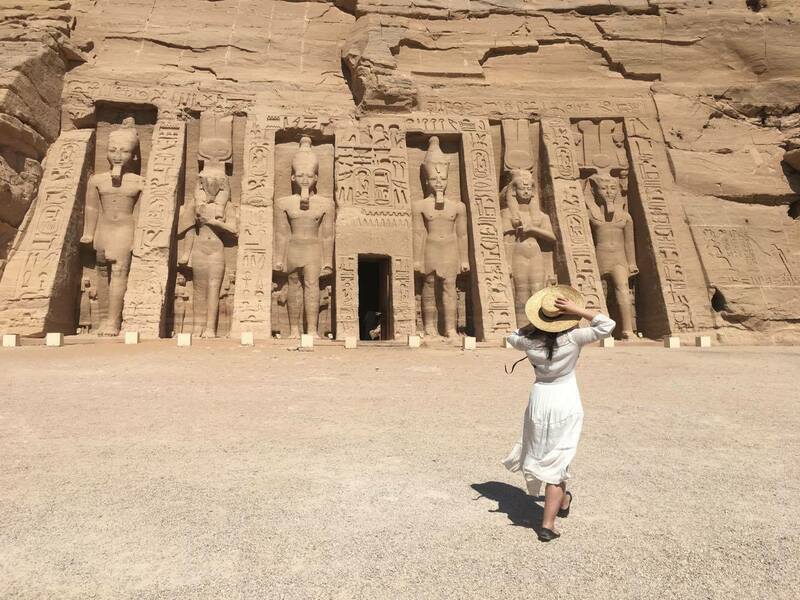 From Aswan you can take a day trip to Abu Simbel Temple, although it is a 3.5 hour drive each way with an early start to try to beat the heat at the exposed site. Guides aren’t allowed into the temples so we stood with our Intrepid guide Waleed in the shadow of four huge statues of Ramses and he told us the history of the temple and what to look for inside. The walls are covered with hieroglyphs and carved scenes of offerings and the afterlife. Waleed’s recommendation was to walk through the two temples before taking photos and by the time we’d seen both temples, most of the other groups had started walking back and we had the site to ourselves. 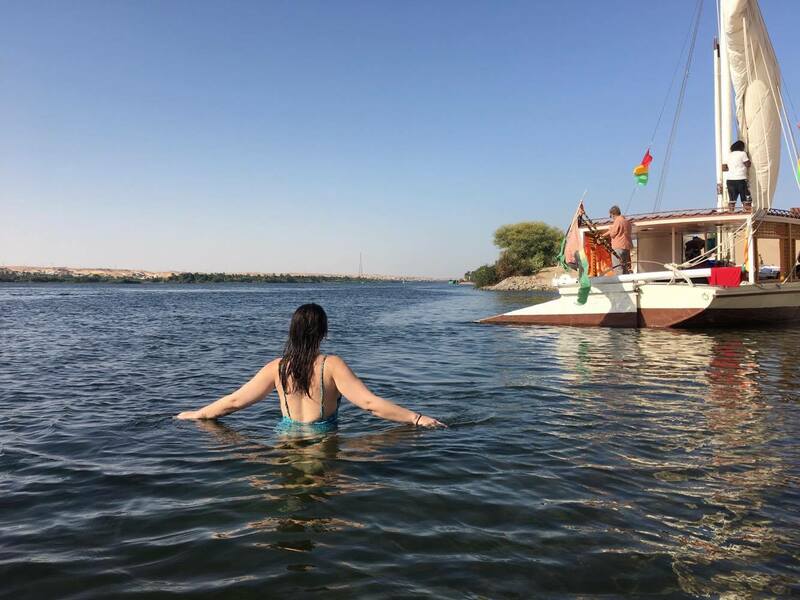 We travelled by felucca, a traditional boat, to Luxor tacking South against the current of the Nile River until we banked at a tall dune of sand. Changing into swimsuits we waded into the clear river water until it was deep enough to swim, minding the strong current. Clambering back on board, we jumped together from the canopy before drying ourselves off by sitting up top and ducking under the sail as we continued on. Feluccas can’t sail at night so we again banked and enjoyed dinner cooked by the felucca chef. Later, those that weren’t too tired out sat around a campfire to sing and talk with the crew who had boundless energy. 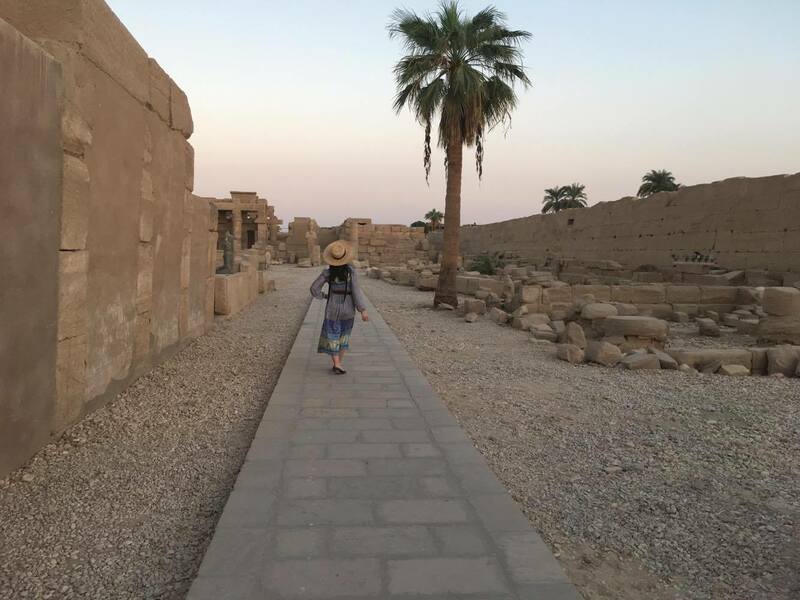 Temples are the main drawcard in Luxor but it’s also the place to pick up authentic porcelain scarabs and alabaster statues. 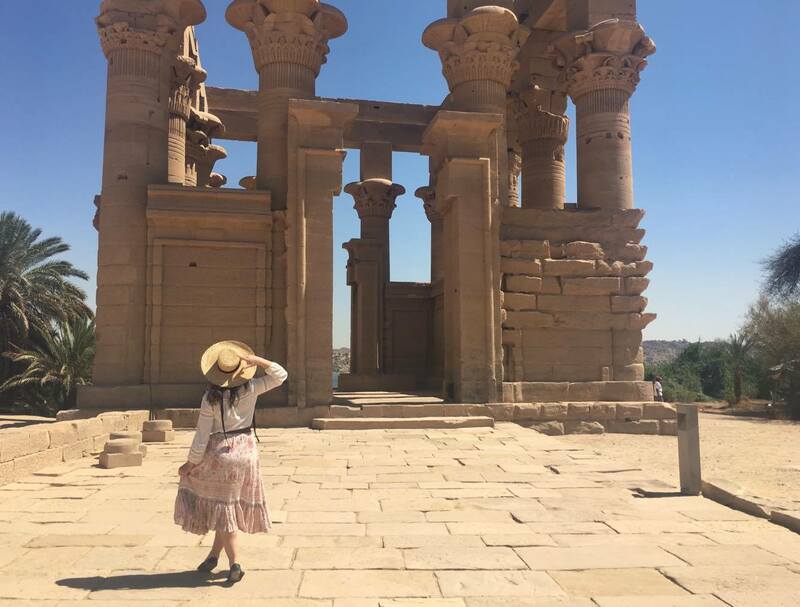 First stop on the itinerary was Karnak Temple, a sprawling complex where you’ll find obelisks, a sacred lake, sphinxes and an incredible open-air hall of columns with traces of colour still visible. We went later in the day and watched the sunset in the temple, leaving just as the gates were shutting. You’re not allowed to take photos at the Valley of the Kings and once again, guides don’t accompany you inside the tombs. Instead we sat on benches under open shades and listened as Waleed explained the history of the Valley of the Kings. Extra tickets were purchased for certain tombs. I skipped Tutankhamun’s tomb but purchased a ticket for Ramses the ninth. The hieroglyphs in the tombs are incredible, the colours are vibrant and look like they were painted on a few years ago not a couple of thousand years ago – not to be missed. 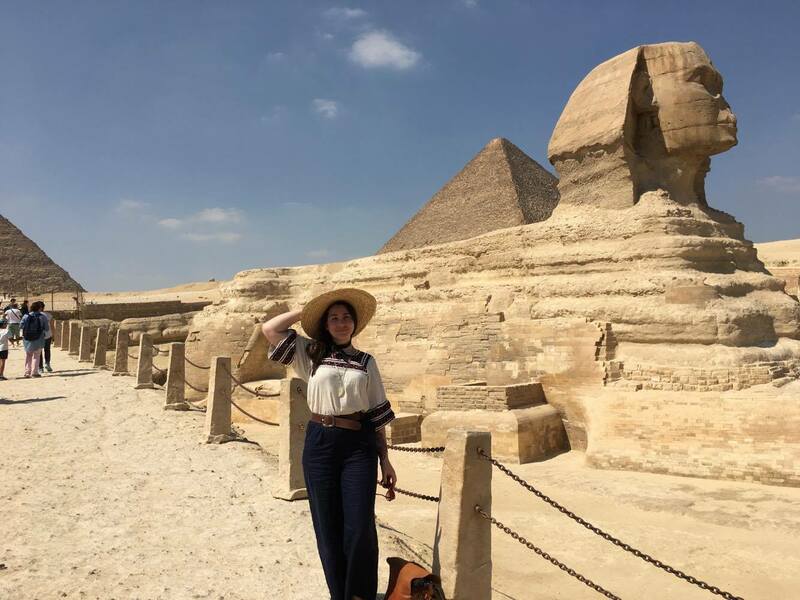 The Valley of the Kings, the Pyramids and Tutankhamun’s mask is the Egypt you’ll recognise from films, books and television and they’re worth the hype but Egypt is a country of generous, friendly people with a variety of amazing temples to explore. It’s hard to narrow it down but jumping off the felucca with new friends was probably the highlight of the trip for me – or perhaps a tie with the Giza Pyramids. Keep an eye on your relevant government advisories on visiting Egypt. I had concerns about safety as a single female so chose to go with a travel company. I spoke in detail with my agent prior to booking and kept in touch with my family with a daily short update via email where possible. I felt entirely safe while there and didn’t find myself hassled any more than the men in the group. You can change money at the airport and there are plenty of ATMs and Bureau de Change offices in Cairo. At the airport prior to immigration you’ll need to purchase an Egyptian visa for $25 USD. Haggling in the markets is normal even when you’re an Egyptian. When you walk through the markets, vendors will call to you constantly. It can get exhausting and it’s ok to ignore them or to say no thank you. The essentials are sunscreen, tissues, insect repellent, Imodium, electrolytes, hand sanitizer, a hat and a scarf. Make sure you always have change for toilets and some tissues. Learn some phrases, particularly hello, thank you and no thank you. Don’t drink unbottled water unless you really can’t help it or you might find yourself still in Egypt, with a tummy bug, before you’ve seen the other half of the world. Have you visited Egypt? Please share any tips or advice with our readers in the comments below! Read Next > Is Solo Female Travel Safe in Cairo? Wow, that’s an amazing tour experience! When you have a good tour guide it makes ALL the difference! 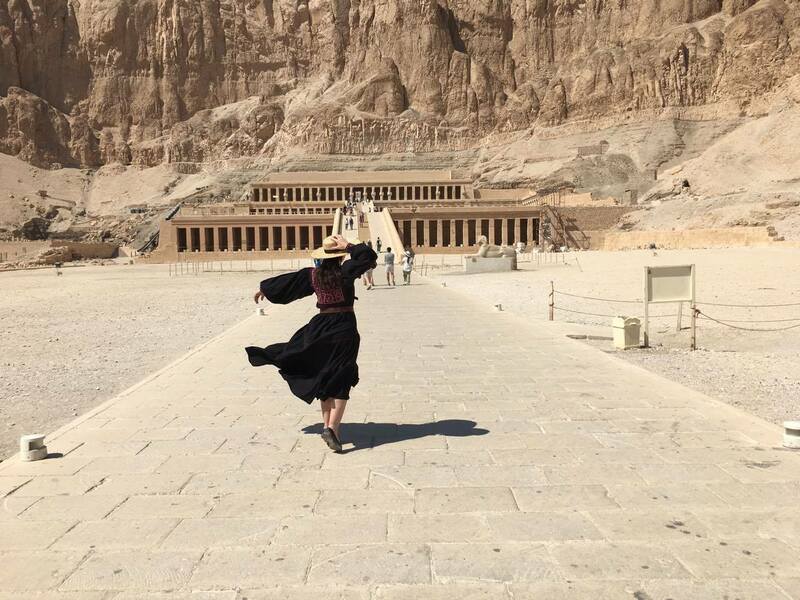 I’ve never actually had a desire to visit Egypt …. until now! Thanks for a great article. Thanks Lynne! I was a bit worried about my safety but felt completely secure while there, would 100% recommend for history, culture and shopping. Love your article!! My dream is to visit Egypt one day,.in which season you visited it? Thanks Georgina! I visited in October (I was there for my birthday) so it was quite hot but bearable, just be prepared with hat, sunscreen and a lot of water! Thanks Zoe! I kind of want to return… But there’s so many other places to visit first! No way!! I think they have 8 guides for Egypt- I had Walid. What is your ig handle?? It was so good hey!! I miss so much about the trip (maybe that’s why I’ve done it twice!) The sunrise was pretty incredible, I ensured that my group knew that Abu Simbel was unmissable (I just wish there were more bathroom breaks) So glad you had a great time Leslie! 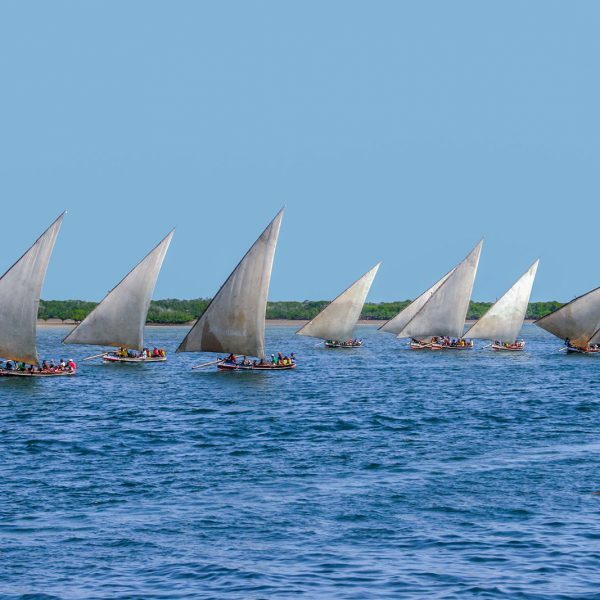 I am currently trying to decide between the Intrepid Tour that you did and another one that includes a traditional three day Nile cruise but no Felucca overnight. Do you have an opinion? 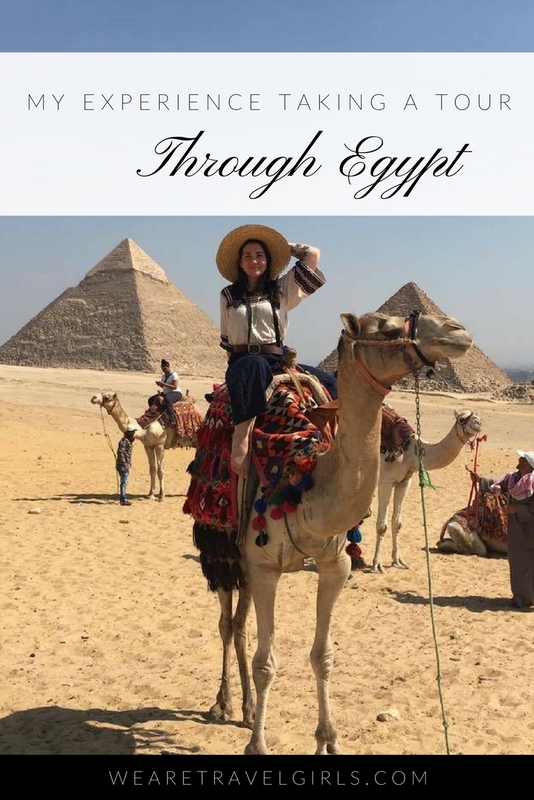 I am completely an ‘off the beaten path’ traveler and although I’ve heard a Nile cruise is a ‘must do’ just don’t know if it is really that great or a bit touristy. Did you feel it was enough time on the water? I have traveled with Intrepid before in places I don’t feel comfortable traveling solo. They are a great company. Thank you again! I’m Ahmed from Egypt-Aswan, you’ll not like “Nile cruise” it just big boat in the Nile :), do not forget it will be middle of September as you said, so it will be over heat in this time. One more thing…I will be there the middle of September so I don’t know if that makes a difference being on board with the heat. Was there ample shade? on the Intrepid trip there was heaps of shade. The nile cruises are very touristy, comfortable but touristy, I’d say you should go for the felucca ride and the swim in the Nile, you get ample time traveling down the river.